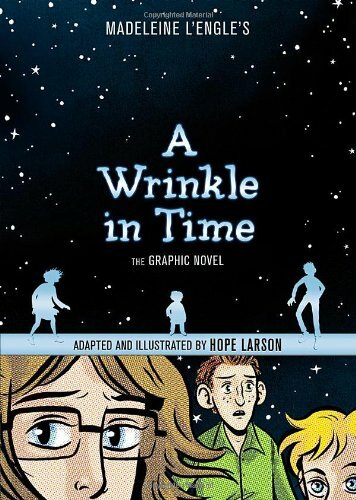 Check Out A Sample Of Hope Larson’s Comic Adaptation Of A WRINKLE IN TIME | Birth.Movies.Death. Madeline L’Engle's classic science fiction story gets a graphic retelling at the hands of the artist behind CHIGGERS and MERCURY. Up front: I know Hope Larson. Madeline L'Engle's A Wrinkle In Time was a real gateway book for me. That book, and A Wind At the Door and A Swiftly Tilting Planet, hit me at the exact right age to make the leap from pulpy scifi and comics into stuff that was smarter and better. The story of Meg Murry and her brothers traveling through a tesseract to save their father from universal evil was full of wonderful big ideas and soaring themes that truly moved me when I was 9. A Wrinkle in Time has never successfully made the leap to another medium, despite its awesome centaur-like creatures and fantastical alien worlds. There was a TV movie that stank, and there's been a low-budget adaptation brewing at Disney for a long while, but it's been otherwise a fairly untouched novel. Now Hope Larson has adapted the book into a graphic novel. Hope is the writer/artist behind some really wonderful young adult-oriented comics like Chiggers and the absolutely excellent Mercury; she's been working on the book for a couple of years now and it's finally being released this October. The first chapter - where the children meet Mrs. Whatsit and the Tesseract - is up on her site and you should check it out post haste. I'm excited to read the whole thing; this series and the Tripods series were my Young Adult books of choice*, so I'm excited to revisit the Murrys and The Black Thing and Uriel and experience the adventure in a whole new format. And you know, looking at Hope's art, this would make an amazing animated movie. * special mention to Alfred Hitchcock and the Three Investigators.